If you are a parent you know that Lego’s are both a joy and a nightmare! The joy is in the fact that the kids take lots of time in the assembly of these creations, plus they get to be creative. I know my kids have made entire villages out of theirs. Now the nightmare, stepping on them- OUCH! Okay, all kidding aside the nightmare of when they have one these creations fall apart or take them apart, then want to put them back together again. Last year was big Lego year for my kids and they received several sets. A few days ago my little guy asked to put together this insane multi piece wheeled creation that he got in 2011. Lucky for him that his mom has a touch of OCD and I had all the directions saved in a cabinet in his brother’s room. Then it hit me, he’s old enough to build this stuff all by himself and he should have access to all the directions whenever he wants to build. I grabbed an old binder ( Why do people always seem to have old binders lying around?) and went into my scrapbooking supplies to find some sheet protectors. Then viola!, I put all the instructions in the sheet protectors and the binder went into the kids room. They can now reference all their sets anytime. I got big time mommy points and lots of hugs for this one! Thought I would pass it along, and just for the record, I have a binder for all my take out menus as well. It saves time and you can use a wipe off marker to circle the items that you are ordering, then wipe them off! Do you have a Lego tip to share? I’d love to hear it! i have been keeping ours in a small tub! Josiah will love this! thanks! Good luck with that. I sorted out pieces in bins too, but they play and it didn’t last too long. 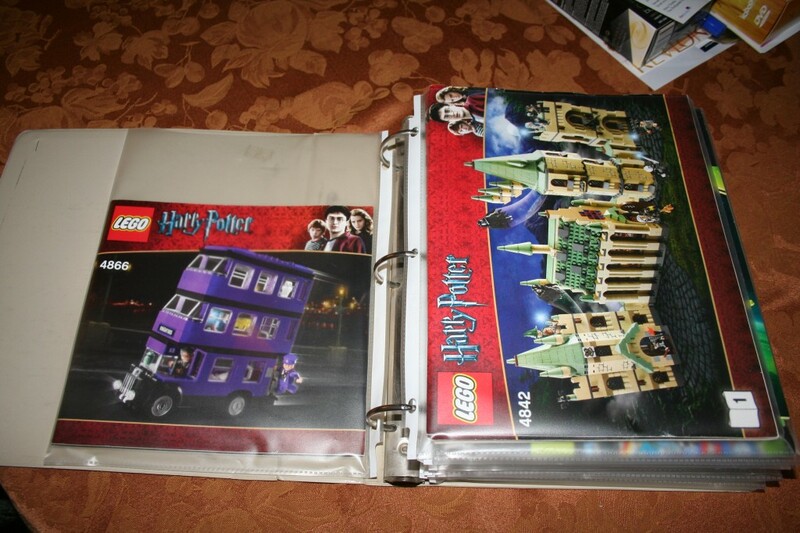 What a great idea on how to keep all the booklets sorted! This is a great idea! We have a bunch of plastic bins and boxes for the different lego sets, I think I will slip the directions into a plastic sleeve and glue it to the inside of the coordinating bin or box. This brings back memories!! I loved organizing my kids’ Legos. They were the best investment we ever made. That is actually a brilliant idea. I have all of our introduction books piled up in a drawer. Simply brilliant! I don’t know why I didn’t think of that. My poor kids instructions always get ruined. I just found my sons lego books jammed in his dresser drawer. This is a much better solution!! Great minds think alike! I do the same thing for my boys! 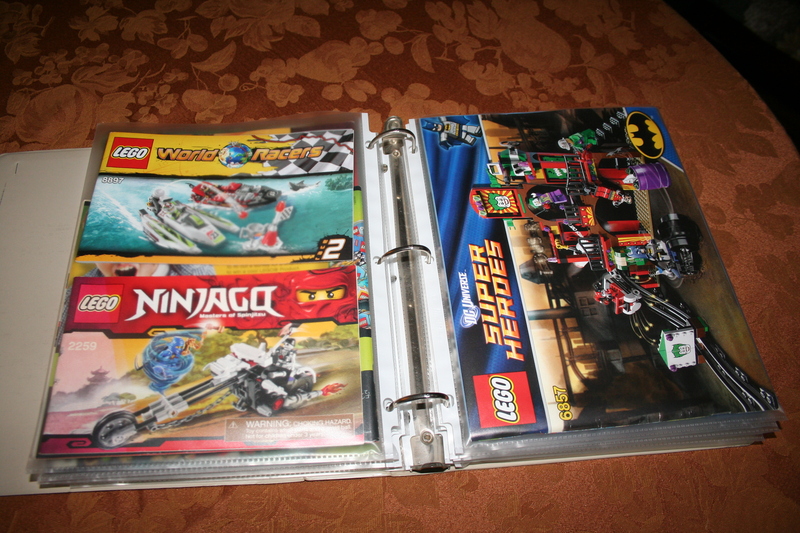 They even keep their Lego magazines in it that they get in the mail. We Started off like this then we ran out of the sleeves and I had not gone to the store to get more, This is a great idea. Oh my gosh I wish I had a system like this when my son was young. Those lego builds are so complex and I felt bad when he had to take them apart. Well I know exactly what I am doing this weekend. Seriously this is the best idea ever!